A member of Texas' House of Representatives has filed a resolution to urge Texans to stop using an emoji representing the Chilean flag when they really mean to use the Texan flag. An emoji of the Chilean flag is widely available while one of the Texas flag is not yet. The Chilean flag with its white star on a blue background resembles that of the Lone Star state. Tom Oliverson said the resolution was meant to be mainly educational. 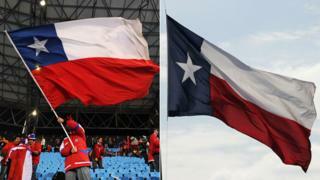 The resolution calls on lawmakers "to reject the notion that the Chilean flag, although it is a nice flag, can in any way compare to or be substituted for the official state flag of Texas and urge all Texans not to use the Republic of Chile flag emoji in digital forums when referring to the Lone Star Flag of the great State of Texas". Some Texans have developed a habit of using the Chilean flag in text messages and on social media as a sign of national pride. None of the US states currently have their own emoji flag. Mr Oliverson said that the idea was to raise awareness about the mix-up in a light-hearted manner. "Even if the legislature decides not to hear it, we have achieved our objective," he said. The resolution would be non-binding and cannot pass into law. There will be no penalties for using the wrong flag emoji. "The Chilean flag is a fine design. Maybe it's the second best flag, who knows, we're not getting into a contest here. The important thing, though, is that it's not the Texas flag," joked writer Dan Solomon in Texas Monthly magazine. "In these divided times, we anticipate that this bit of legislative silliness will be a refreshing breath of bipartisanship," he concluded. The wording of the bill also emphasises the significance behind the flags' seemingly small differences. "The colours of the Chilean flag depict sky, snow, and blood spilled while fighting for freedom, but the blue, white, and red of the Lone Star Flag stand for the Texan values of loyalty, purity, and bravery," it says. Chile and its national symbols have been the subject of mix-ups before. At the 2016 Copa America football tournament, the organisers played Chile's national anthem instead of that of Uruguay as Uruguayan players looked on confused. The following day, the Chilean national anthem was drowned out by music by the rapper Pitbull before Chile's match against Argentina.